Imperial Chinese history is marked by the rise and fall of many dynasties and occasional periods of disunity, but overall the age was remarkably stable and marked by a sophisticated governing system that included the concept of a meritocracy. Each dynasty had its own distinct characteristics and in many eras encounters with foreign cultural and political influences through territorial expansion and waves of immigration also brought new stimulus to China. China had a highly literate society that greatly valued poetry and brush-written calligraphy, which, along with painting, were called the Three Perfections, reflecting the esteemed position of the arts in Chinese life. Imperial China produced many technological advancements that have enriched the world, including paper and porcelain. Confucianism, Daoism and Buddhism were the dominant teachings or religions in Imperial China and most individuals combined all three in their daily lives. 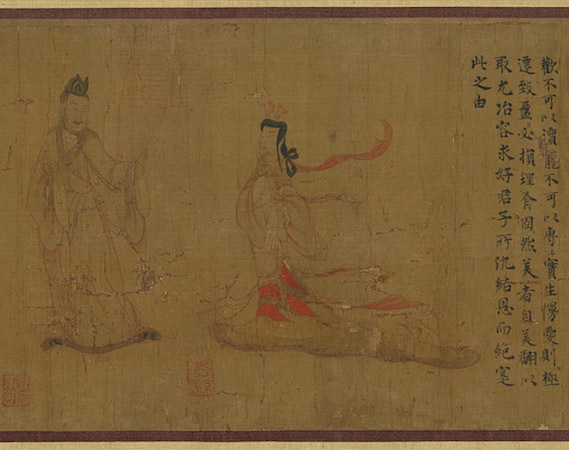 Each of these teachings is represented by paintings in The British Museum, most notably by The Admonitions Scroll after Gu Kaizhi (image above) and the cache of Buddhist scroll paintings from the eighth to tenth century that had been rolled up and sealed away in the eleventh century in Cave 17 at Dunhuang’s Caves of the Thousand Buddhas (discussed in this tutorial). Cite this page as: The British Museum, "Imperial China, an introduction," in Smarthistory, March 1, 2017, accessed April 21, 2019, https://smarthistory.org/imperial-china-an-introduction/.